A color composite image showing multiple detections of the main belt asteroid (872) Holda. The images combined to make this composite were obtained on the first day of the NEOWISE Reactivation survey. 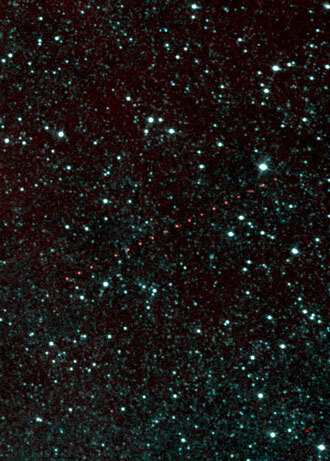 The NEOWISE project is the asteroid-hunting portion of the Wide-field Infrared Survey Explorer (WISE) mission. Funded by NASA&apos;s Planetary Science Division, NEOWISE harvests measurements of asteroids and comets from the WISE images and provides a rich archive for searching WISE data for solar system objects. WISE was launched in December 2009, and surveyed the full sky in four infrared wavelength bands (3.4, 4.6, 12 and 22 μm) until the frozen hydrogen cooling the telescope was depleted in September 2010. The survey continued as NEOWISE for an additional four months using the two shortest wavelength detectors. The spacecraft was placed into hibernation in February 2011, after completing its search of the inner solar system. During its primary mission, NEOWISE delivered infrared detections of more than 158,000 minor planets to the scientific community, including more than 34,000 new discoveries. NEOWISE data have been used to set limits on the numbers, orbits, sizes, and probable compositions of asteroids throughout our solar system, and enabled the discovery of the first known Earth Trojan asteroid. NEOWISE has been brought out of hibernation to learn more about the population of near-Earth objects and comets that could pose an impact hazard to the Earth. During its multiyear survey in the 3.4 and 4.6 μm infrared bands, NEOWISE will rapidly characterize near-Earth objects (NEOs) and obtain accurate measurements of their diameters and albedos (how much light an object reflects). NEOWISE is equally sensitive to both light-colored asteroids and the optically dark objects that are difficult for ground-based observers to discover and characterize. NEOWISE observations resumed in December 2013. Just six days after the survey start, NEOWISE discovered its first potentially hazardous near-Earth asteroid, 2013 YP139. The characteristics of and initial performance of the NEOWISE Reactivation mission are described in Mainzer et al. 2014, ApJ, 792, 30. The Single-exposure image and extracted source information from the first four years of NEOWISE observations were released on: March 26, 2015, March 23, 2016, June 1, 2017 and April 19, 2018 respectively. Diameters and albedos for asteroids detected by NEOWISE during the first three years have been published by Nugent et al. 2015, Nugent et al. 2016 and Masiero et al. 2017. NEOWISE survey observations are continuing in 2019. As of mid-April 2019, NEOWISE is 70% of the way through its 11th coverage of the sky since the start of the Reactivation mission. Over 800,000 infrared measurements have been made of 33,956 different solar system objects, including 987 NEOs and 165 comets. The NEOWISE project has completed reprocessing all primary mission data to extend the search for asteroids and comets to fainter limits, and to take advantage of the improved photometric and astrometric calibrations available. These detections have been submitted to the Minor Planet Center and await ingesting. The Project has also delivered a preliminary catalog of physical properties for known minor planets to NASA's Planetary Data System, which will be updated at the end of the mission to include the improved photometry and astrometry from reprocessing, recent data from the NEOWISE Reactivation Survey and properties of objects measured in stacked observations. The Principal Investigator for NEOWISE is Amy Mainzer of the Jet Propulsion Laboratory (JPL). JPL manages NEOWISE for NASA&apos;s Science Mission Directorate, and carries out mission operations. The Space Dynamics Laboratory, Utah State University provided the science instrument. Ball Aerospace and Technologies Corp. built the spacecraft. Science operations, data processing and archiving take place at the Infrared Processing and Analysis Center at the California Institute of Technology. When acknowledging the NEOWISE project, please cite Mainzer et al. 2011 ApJ 731, 53.